These FSR's are perfect for robotic grippers, robot feet, and similar applications. Upgrade to the FSR Kit! 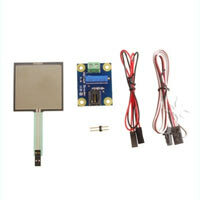 The kit includes an FSR (female connector), a Phidget Voltage Divider, and the necessary cables for fast integration with the Phidgets 8/8/8 Interface Kit.